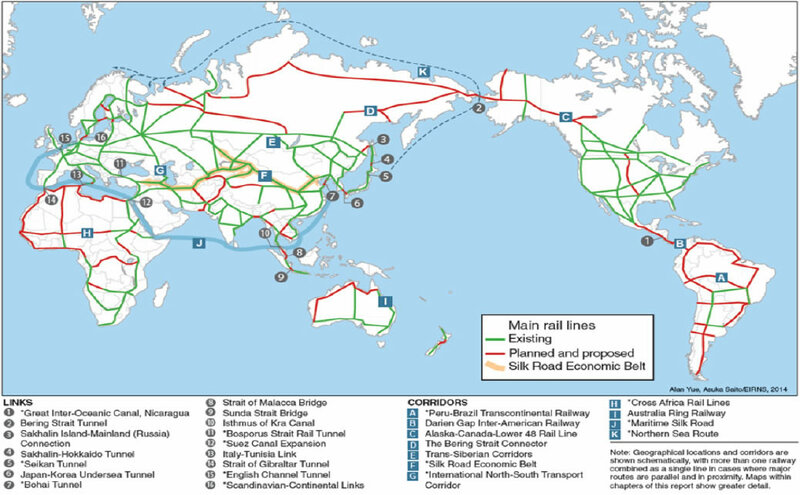 The ongoing development in the Eurasian land mass known as the One Belt One Road is patterned after Lyndon LaRouche and his wife’s concept of a Eurasian Land Bridge that will spur development for all countries being traversed by modern railway networks. This to them is the formula by which peace could be fostered through unity in commerce and peaceful exchanges of culture. It’s very important that people understand the nature of the grand strategy which Lyndon LaRouche has been committed to, and what his wife Helga Zepp-LaRouche is committed to—a grand strategy for humanity, as against the oligarchical principle of the British Empire, where for us, economic development is the basis for peace. It’s the basis for cooperation among different nations throughout the world. It’s John Quincy Adams’ conception of a community of principle among a family of sovereign nation-states, where man can actually then carry out his mission, which is not only to develop the planet for man, but also to explore and colonize space. Going back to the Critias and the Timaeus, which I mentioned at the beginning, the point is that man is confronted with floods, he’s confronted with fire—and in this case with hurricanes. The basic point is that there are acts of omission and acts of commission which result in a destruction of humanity. The acts of omission include not building the infrastructure that could actually mitigate hurricanes and so forth. There’s an act of omission, if you don’t work with Russia and China on a joint strategy to prevent asteroids striking the Earth. Then there are also acts of commission, which include unjust wars—which is fire, thermonuclear fire. There are also acts of commission, including financial policies which are designed from the standpoint of enforcing zero economic growth and population reduction, which have been the policy of the British Empire. I think, as Lyndon LaRouche has said, victory is within our reach, if we move right now, because we now have a different situation than in the 1890s and the beginning of the 1900s. That situation resulted in over a hundred years of war—two world wars, and then perpetual warfare, with short breaks, after World War II. Today we have the potential to actually win, and the basic point is we have to break out now and seize the moment to put together an alliance, which LaRouche has called the Four Powers—the United States, Russia, China, India—to defeat the British empire. This would be a liberation of the people of the United Kingdom. It’s not aimed at the British people. In the United States, we have to move with what LaRouche has called the Four Laws: This is a policy of Glass-Steagall, national banking, in the sense of Roosevelt’s Reconstruction Finance Corporation and Hamilton’s National Bank, to issue credit for economic development. We cannot operate from the standpoint of the miserly conception that “we can’t spend the money to save people.” We’ve spent trillions to save bankrupt banks! We spend trillions to carry out unjust regime-change wars. What we need to do is to invest in people: Save the people, and cancel the British system. Question: As far back as the late 1800s, in China, after China was beaten by Great Britain in the Second Opium War, I think Lincoln sent as his ambassador a man by the name of Burlingame, and then later Wharton Barker, to help with the development of the railway in China. I know that the great Dr. Sun Yat-sen, in 1907, wrote The International Development of China, which was the roadmap for developing China’s industrial and economic capability. So all the railways, all the waterways, everything that China is now today doing, come from blueprints from Dr. Sun, and essentially—it seems to me—from Lincoln. Can you comment on the future of potential collaboration between China and the United States, and the collaboration around infrastructure development? Wertz: What you developed is precisely the case. For instance, the entire plan of Hanotaux and of Witte, was to make sure that the trans-Siberian Railroad actually went through Manchuria. The basic idea was to free China from the British. There were two Opium Wars in the 1800s, prior to this period; there was also a brief war between the French and the Chinese in the Vietnam area. Sun Yat-sen is another reflection of exactly how Lincoln’s policy was spread, in terms of the ideas, through Europe, Russia, China, and other locations. The irony is that China has actually been engaged in precisely what Franklin Roosevelt was committed to: To develop the world through American methods, like the Tennessee Valley Authority, or the Grand Coulee Dam, the locks in the St. Lawrence Seaway, or the Boulder Dam, and the Four Corners policy of Franklin Roosevelt. He wanted to spread this throughout the world. And that was based upon Alexander Hamilton. Graham Lowry’s book discusses this: The British did not want the United States to move west, to develop the continent as a whole. And this was the perspective of the Founding Fathers—to move west, and eventually this was consolidated with the Transcontinental Railroad of Lincoln. The basic point here, as Lyndon LaRouche said the other day, is that victory is within reach. Because we do have some adults who are creative in leadership positions in the world today, which has not always been the case. There was a recent article in the China Daily, which featured an interview with Helga Zepp-LaRouche. She reported that she had gone to China back in the 1970s during the Cultural Revolution, and saw the devastation that existed there. And then she returned much later with the perspective of the Silk Road. And there’s an appreciation in China of the role that the LaRouches, and particularly Helga in terms of China, have played. You see what Lyndon LaRouche has done, really from the 1970s. He wasn’t just concerned about the United States. He functioned, as Schiller said, “as a patriot of his own country, but also as a citizen of the world.” He was elaborating programs for development for the entire world, in the spirit of what Franklin Roosevelt told Winston Churchill that America was going to do, as opposed to what the British Empire wanted to do. That is where we are today, and I would just say, as I stressed, this is what’s at stake right now. It’s really up to, in this country, the American people—but obviously throughout the world, for people to really understand this: that you’ve got rise to the level of grand strategy, of a grand design for the world, for humanity as a whole. You’ve got to approach it from that standpoint. Yes, fight for your own people, but you also have to fight for humanity as a whole—and it has to be based on truth and the question of justice. And I think that’s really the issue, and we’ve got to mobilize to make sure that this succeeds at this moment. Question: I’m from New York. One of my many interests in this world is to remind people that they can think for themselves. They don’t need a media outlet to tell them what to think. I’m in the business of teaching people how to think. So, it pains me, not as just an educator but as a human being, when I see other Americans hoodwinked by things like Russia-gate. When you look at just New York City alone, we have a failing infrastructure, with a subway system that is overcrowded and over-packed. We have roads that people can’t even drive on any longer—and yet people care about how many scoops of ice cream Trump gets every day. So, the essential question here is, how do we make sure that this is the last time a Russia-gate happens, so that people can now, instead of talking about themselves, or worrying about what their President eats—they can worry about fixing their own country, fixing their own state, ensuring that people can be educated—the real issues? Wertz: I think the American poet Edgar Allan Poe addressed the issue most directly in a short story called “Mellonta Tauta,” because what he said there is that the oligarchy is able to control a population to the extent to which it is convinced that there are only two pathways to truth—empiricism and logical deduction. If you look at all of the things that we’ve been confronted with over the recent period, that’s precisely the way in which people have been brainwashed. They look at the empirical evidence which they’ve been fed by the media, by so-called authorities, and they operate from the standpoint of certain logical deductive axioms. And they’re trapped in this situation. But Poe basically said that the empiricist’s method is the Baconian method. He was referring to Francis Bacon, and the logical deductive method is that of Aristotle, to whom he referred. To be human, he said, is not to creep or crawl, as you would from the standpoint of empiricism or logical deduction; but rather to soar and to use the method of hypothesis, which is the method of Plato, of creative thinking. He said this method is the method of Kepler, and that is the real critical issue. People have to understand how to think. If you think that the only way that you come to knowledge is through empiricism or logical deduction, then you’re controlled by the oligarchy. This is a fundamental principle that people have to actually understand. We have reason to be optimistic, because the world has a very clear alternative, represented by a New Paradigm. To the extent to which you see people responding, for instance in the face of these hurricanes, in a manner which is similar to that of the Good Samaritan—that is what makes us human. Just to reflect on what you were saying—it is a passion for the truth, a commitment to humanity. It’s what the Greeks called agape, or love. It’s that quality that is evident in the situation in many sections of the world today. Look at the win-win strategy that was put forward by the Chinese—this is the strategy that ended the Thirty Years War in Europe in the 1600s. It was the concept of the Treaty of Westphalia, to act on the basis of the benefit of the other, as opposed to egoism. I think this is also what the poet Percy Bysshe Shelley referred to in his A Defence of Poetry; it’s a kind of mass-strike phenomenon, which is not an economic strike or a general strike. It’s a mental process in which people rise above their parochial interests and think about humanity as a whole. What we require right now is to really elevate the kind of good works that you see—such as in people risking their lives to save other people in the case of Texas; or what we saw with the first responders on 9/11. We have to actually rise to the level of “what do we need to do for humanity right now?” Think in those terms, which is to think big, in terms of what the mission of man is. And I think if we do that, then we have the potential for bringing about a very fundamental change right now. President Trump could take certain actions right now. The “Russia-gate” is blown out of the water by the evidence that has been presented here today. He should seize the moment, not just to raise the debt ceiling, but rather to move with his promises during and after the election, and to work with China and Russia to eliminate the danger of thermonuclear war, and to join in the fight against terrorism, which the Russians have advocated repeatedly. That’s the direction in which we have to go. That will bring about a complete shift in the world as we know it. “free china from the british” – “british” means JEWS. What you really mean is “free the planet from JEWS”. The hub for jews has always been the UK. ‘british’ is a hebrew word fostered on the UK after native anglo-saxons were conquered by the french at 1066 (cos remember little birtain is in france, and england was conquered into being the ‘greater’ britain). Unfortunately, jews have forced their breeding so well that people cant tell whose who anymore,hence the term ‘crypto-jew’. And of course, Trump is being held back and kept in line by the jews/israel, which is called “the deep state”. Gods chosen ones are threatning to kill him and his whole family (whom are all married to jews) if he doesnt toe the line. So his terrible warmongering UN speech was a giant ode to netenyahu.